Text Copyright © 2018 Michael Babcock. Images Copyright © 2018 E. Boulet. Note: When you click on an image a large version will appear in a new window. I strongly suggest that you do this for each image so that you can see and appreciate more of the details and nuances of the art. 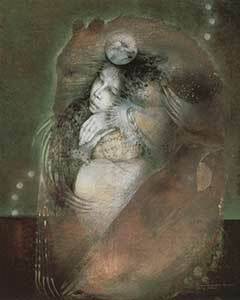 Susan Seddon Boulet was an artist who was born in Brazil to British parents. 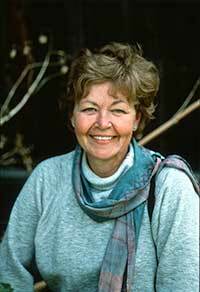 Her public career spanned nearly three decades (1970 – 1997) in the San Francisco Bay Area. 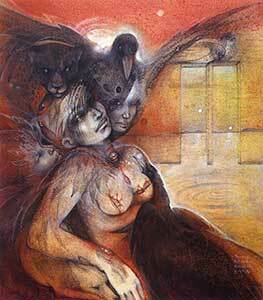 Working primarily in oil pastel, pencil and ink, she is best known for her images of shamans and goddesses. And the work certainly allows me to understand … it’s my own tool for understanding myself much more than it is anything else. 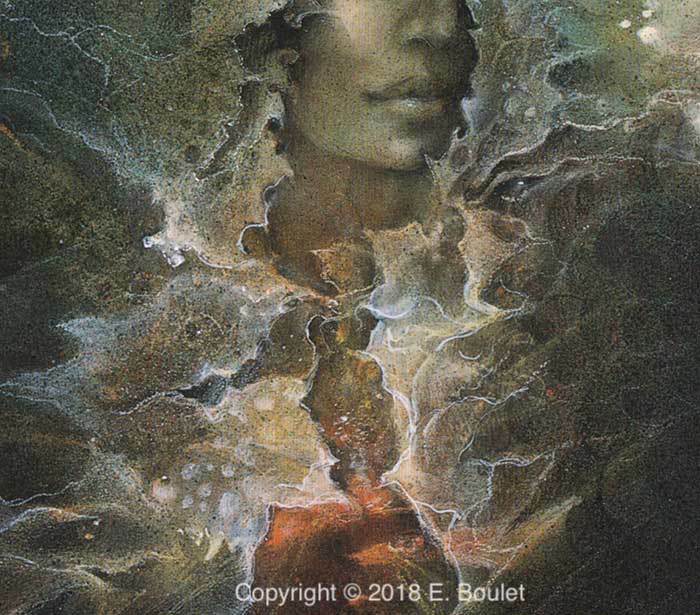 Myths were important to Susan for she felt that they connected her own psyche to the Collective Unconscious, a vast repository of psychic material common to all humanity. 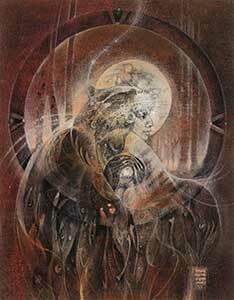 By understanding the myths that emerged in her work, she could understand her own journey. I want the images not to tell people what to do but to call them into their own imagery. . . . I think for me if they act as doorways, as symbols tend to do, that’s what I’m mostly interested in. That it pull people into their own things. You know, their own imagery. Susan was diagnosed with breast cancer in September of 1989 when she was 48 years old. A modified radical mastectomy of the left breast followed and 5 positive lymph nodes were found. Breast cancer is one of the “ambiguous” cancers: once you have it, it is never considered completely gone: there are marker points but no complete remission. It adds an uncertainty to one’s life. For the last 7-1/2 years of her life, cancer was Susan’s challenge, companion and teacher. Like anyone who is diagnosed with cancer, Susan went through a whole gamut of strong emotions as she was forced to confront not just death, rather her own death, along with the fear of what her life would become. Two years ago I was diagnosed as having breast cancer and went through a mastectomy and I find that having my art was tremendously helpful in the healing process. To have my art to do was a container for me to understand what had happened and also a way in which I could move forward. And having an artform as a container was very helpful and certainly the work itself has changed tremendously . . . . because life becomes such a gift. And life and art are not so different. 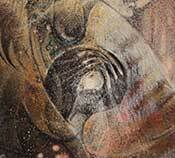 I want to explore what Susan’s art has to tell us about her healing process. Note: Click on the images to see a larger version. Susan painted Healing the Earth in spring of 1990, not long after discovering she had breast canter and the September 1989 mastectomy. We see a deer head that is half skull and half living animal with bare tree branches reminiscent of lightning bolts running through the piece. The living side of the deer is flanked by the sun, a symbol of life and light. The skull is flanked by ravens, carrion birds also oracular in nature that have long been associated with death. In many cultures ravens are mediators between life and death. 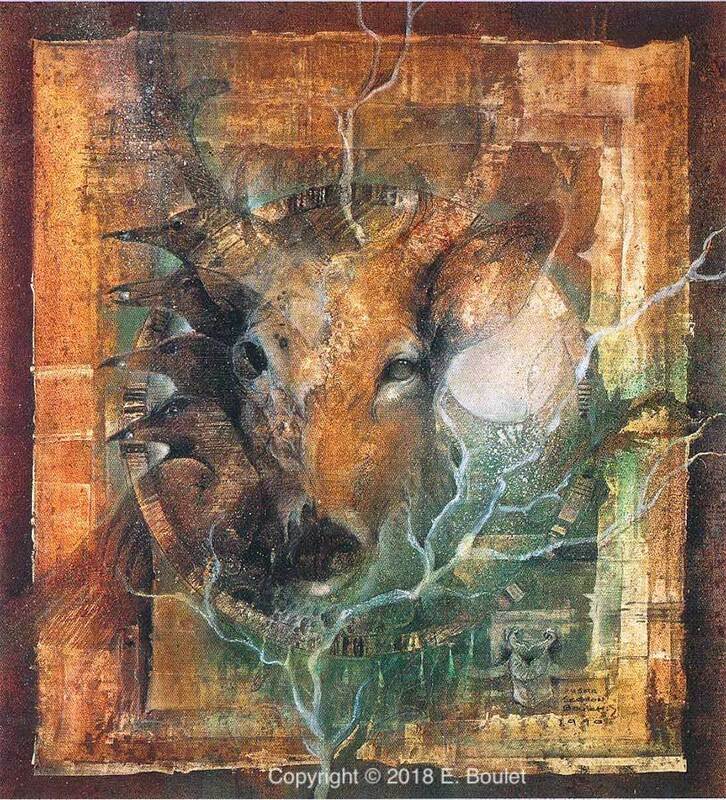 At the top of the deer’s living side, there is a fish: a symbol of abundance, wisdom and of the ability to negotiate changes.
. . . the image is of a deer and part of it, half of it is skull, half of it is life and it’s that point in time in which we can make the decision to go for life or to allow it to disappear and not to be there anymore. And so this is an image that for me would represent that. This piece is called Healing the Earth and it’s that point in time in which we have a choice of going either way, of either losing or healing. The cancer brought Susan to a choice: embrace life or lose it. Like many others, Susan found that the cancer, by forcing her to look at the possibility of her own death, moved her into a new direction and out of her comfort zone. In a 1993 interview with the author she talked of how the cancer forced her to go into her own dark places. For example, when I look at my own story, I think that what I would tend to draw are things that I’m comfortable with and I whereas I tend not to necessarily bring forward the things that I am not comfortable with but also in the process of work over the years that I have approached things that are difficult for me in a mythic way or in a symbolic way that I could handle them. 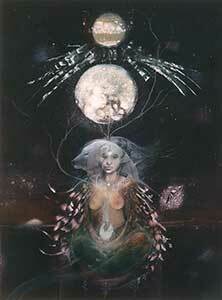 So for example, after the cancer, I went into my own deep feminine earth because the pieces got very dark. And although, they weren’t images of destruction but they were images of darkness, so more images of earth than they were of terror. 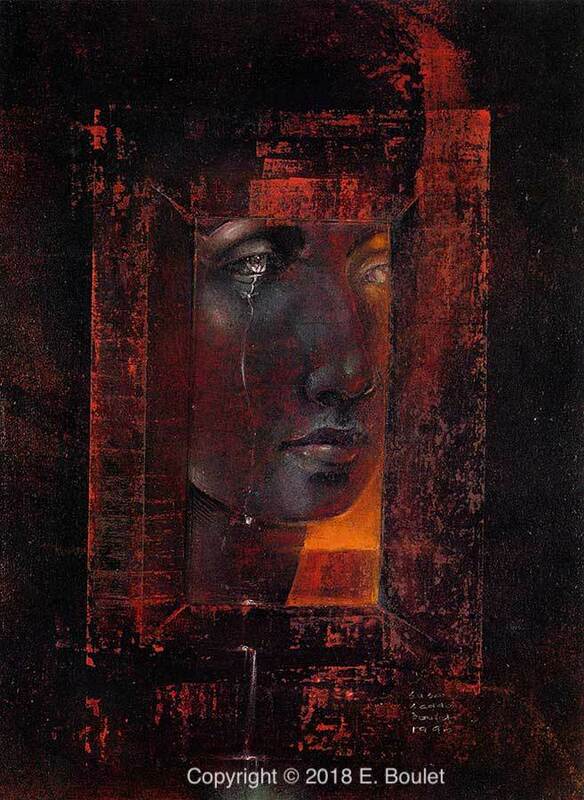 The piece that most reflects what Susan was going through at this early stage of her illness is Persephone, painted in mid-1990. This is a dark piece: it shows Persephone, the goddess of spring who was abducted and raped by Hades, the God of the Underworld. Persephone spends half the year above ground and half the year in the Underworld. Susan focused here on grief, Persephone’s grief and really her own grief as she directly confronted her own mortality, her own abduction from a spring time world into an underworld of death and darkness. In a piece that seems to be given over wholly to despair, Susan included a symbol of life and of hope, one that is barely visible in most reproductions and even in the original easily overlooked. 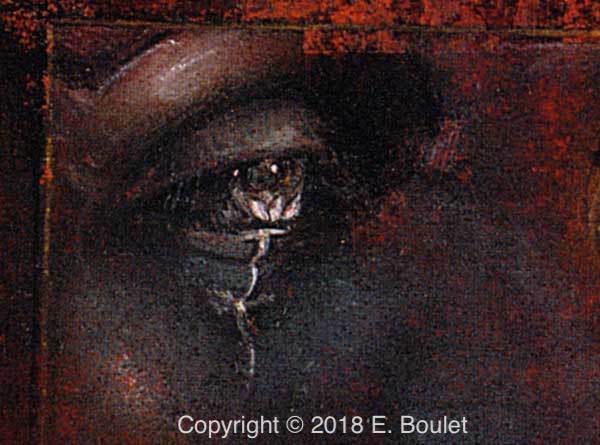 In Persephone’s right eye, from which a tear descends, Susan has painted a flower, representing Persephone’s springtime aspect and a symbol of burgeoning life, found even in the darkest Underworld and deepest despair. Persephone, herself, is a testament to the fact that everything changes, that the dark of winter will be followed by the life of spring as she ascends above ground again – light inevitably follows darkness. It was very much going into my own ground and I think that when one is finally in touch with one’s mortality that something happens to what we do with our lives, with the work that we do, there’s a different aspect to it that hasn’t been there before, which I think lends it strength and a different depth. . . It did very much. And certainly provided an opportunity to explore things in myself I’d never explored before, because none of us want to deal with death. . . . And when we’re faced with that opportunity, and it definitely becomes an opportunity that we live our lives more fully . . . because life doesn’t go on forever at that point. You think “Well, what haven’t I done?” Or, you know, “what is it that no longer serves me?” And so it’s a very important catalyst, in at least in my life. Throughout 1990, Susan struggled with the decision of whether or not to undergo breast reconstruction. She eventually did so in 1991 and it was not successful. She underwent a revision of the reconstruction in November 1992. After that time, she had nearly a year and a half when the cancer receded into the background. She refused to talk about the cancer and once said she even blacked out what it meant to have positive lymph nodes. She wanted to put the cancer behind her. Susan’s names for a piece give us added insight into her thinking. She named this piece Palimpsest. 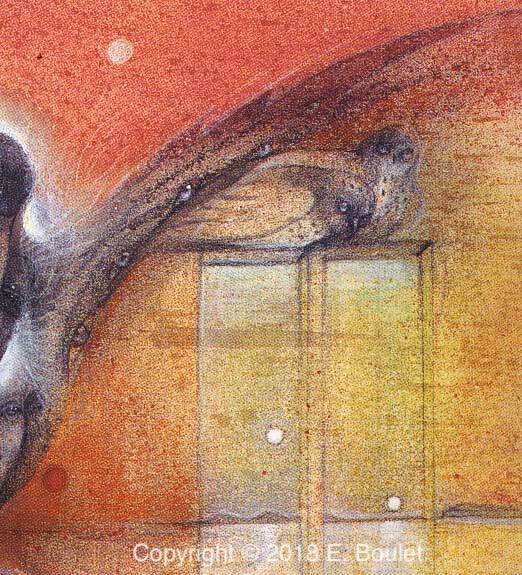 A palimpsest is a manuscript on which original writing has been effaced, making way for other writing, echoed here by the marvelous layering of images, a characteristic in much of Susan’s work. It was painted in late 1991 when she was about to undergo what was to be an unsuccessful breast reconstruction. 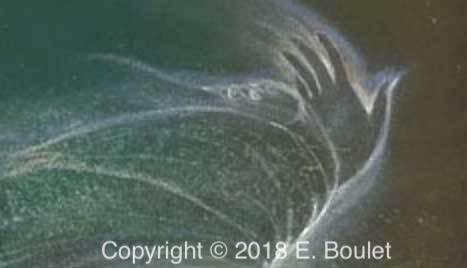 Here a female figure is visible beneath what might be wings or veils or even wisps of a mysterious wind. (Click on the image to see a larger version.) 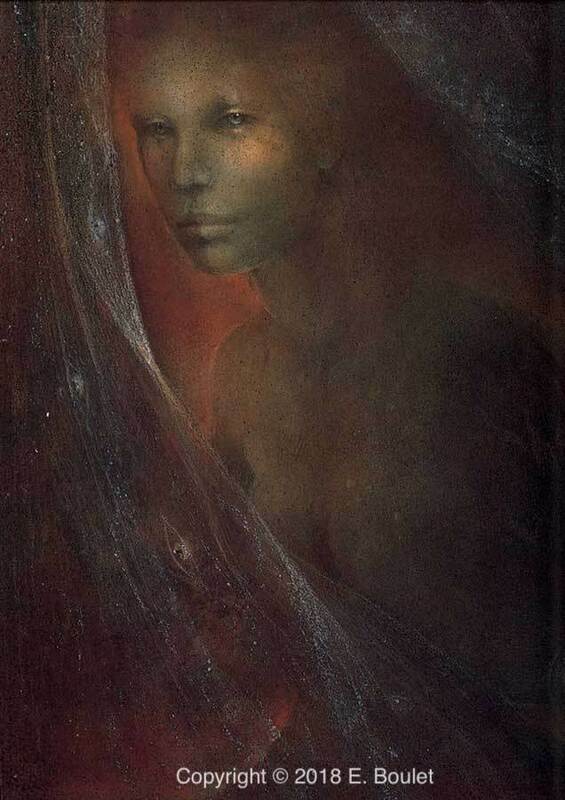 For her book The Goddess Paintings, published in 1994, Susan chose this piece to represent the goddess Ishtar, who has intriguing mythological resemblances to Persephone. Ishtar is the Babylonian creatress of all life, goddess of both love and war. 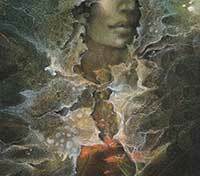 She descends to the Underworld, shedding a veil at each gate, in order to restore the vegetation god Tammuz to life, thus restoring fertility to the earth. After three days, Ishtar returned from the Underworld, seen by Susan as a dark, transformative place. 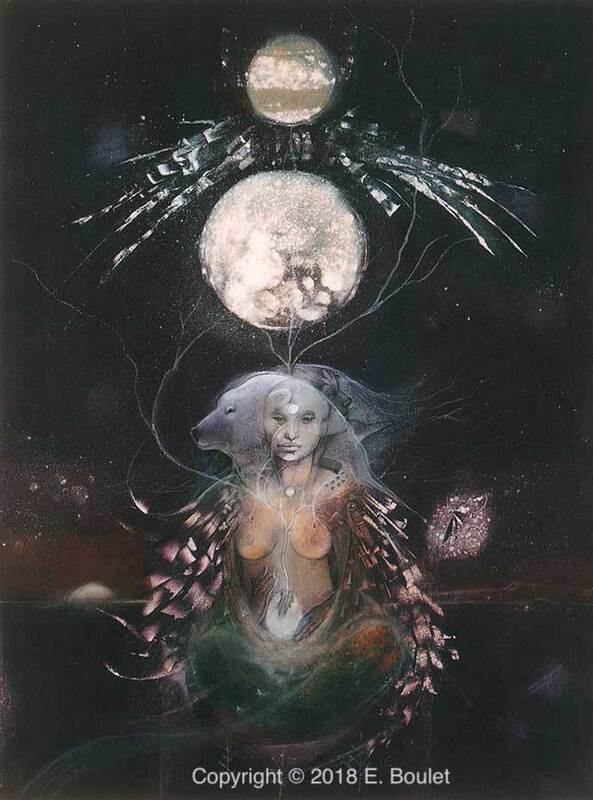 She compared Ishtar’s return as being “like coming out of a cocoon or a snakeskin” and in a 1994 interview with Rhonda Anderson on the cable TV show A Different Perspective described this as a work of emergence.
. . . this is the part where after she has been in that dark place, where she is beginning to re-emerge and the re-emergence after we have been in a dark, transformative space is always to do with a new perspective . . . we come back with information that we didn’t have before. So in this piece she’s actually very shy. It’s like the emergence out of a cocoon, or like shedding snakeskins and the light that’s in the heart is still covered, she’s still protecting that very carefully. But it’s, it’s very much an emergence piece for me. Where Persephone was forced into the Underworld, Ishtar goes by choice. I think Susan was coming to a different understanding of her own descent. The name Palimpsest tells us that Susan has begun to come to terms with the illness and is ready to write a new chapter in her life over the old one. There is a certain shyness and veiled quality to the figure, still somewhat vulnerable as if just working up the courage to re-emerge into the next stage of her life. Susan was beginning to emerge from the darkness of her cancer – a new person was emerging on top of the old. 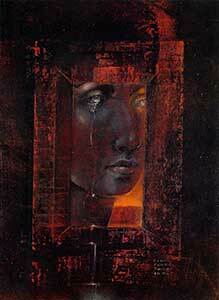 This piece, Out of the Shadows, was painted at the same time as Palimpsest. (Click on the image to see a larger version.) They are really variations on the same theme of emergence. 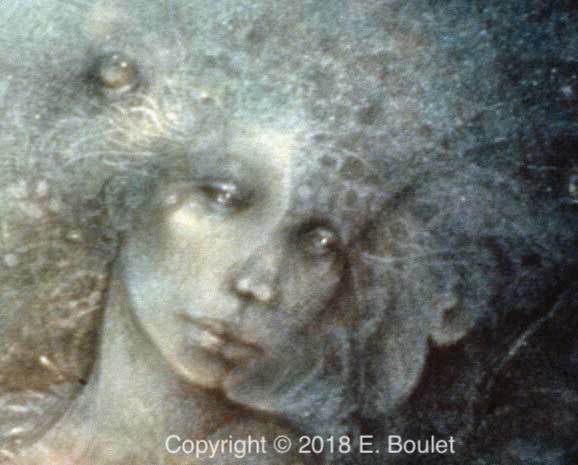 This is a more subdued piece; it looks as if the woman still has not decided whether or not to emerge as she glances out from her hiding place. 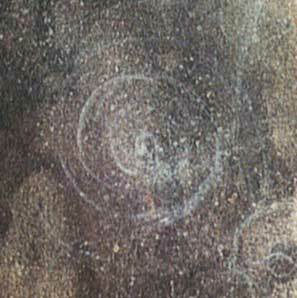 One eye is clouded over, a motif that Susan used in many of her works to indicate that one eye was looking inward and the other out. 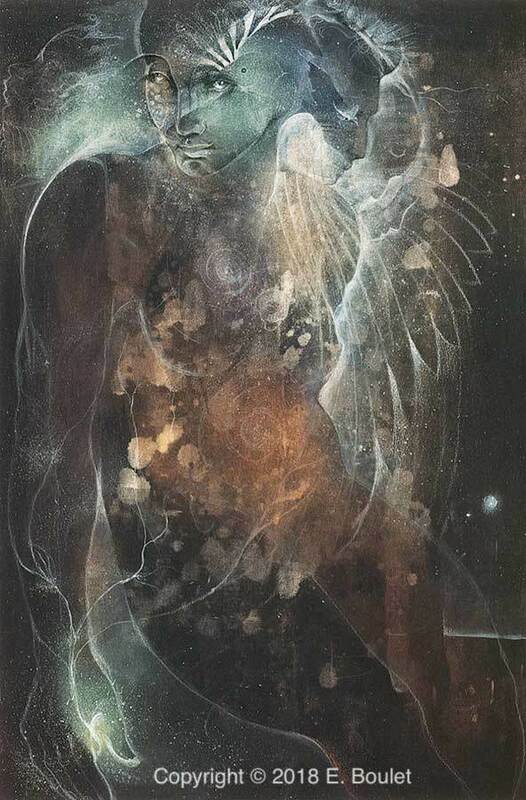 Susan chose this piece to represent the Sumerian mother goddess Inanna who, like Ishtar, descended into the underworld where she is killed, resurrected and then returned to life. Perhaps this piece reflects Susan’s uncertainty about the efficacy of her healing, as she peered out of the shadows, not yet ready to emerge. Healing from an illness seldom takes place in a straight line, so it is natural that there would be variations on themes. Beauty and the Beast and Psyche and Eros have become my stories in terms of my understanding my own development through the stories themselves. The story of Psyche and Eros follows the mortal woman Psyche, who was married to the god Eros, subsequently lost him, and tells how she went through 3 quote impossible tasks unquote to be reunited to him and to be transformed herself into a goddess. For Susan it was a myth of how Psyche integrated all parts of herself, including the masculine (represented by Eros) to find her true Self (with a capital “S”). I think in that particular piece a lot of it was the coming together of the dark psyche, the feminine, the deep feminine, and Eros as wingéd light, or, with perhaps the masculine, the love, nature and the joining of those two parts creating something bigger than the sum of the two. . . . the joining of those two parts creating the transcendence into something greater, so into greater understanding. 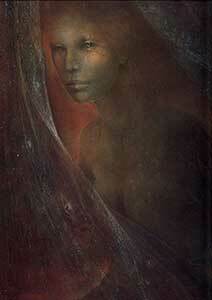 In order to complete one of her tasks, Psyche had to descend into the Underworld, like Persephone, Ishtar and Inanna. 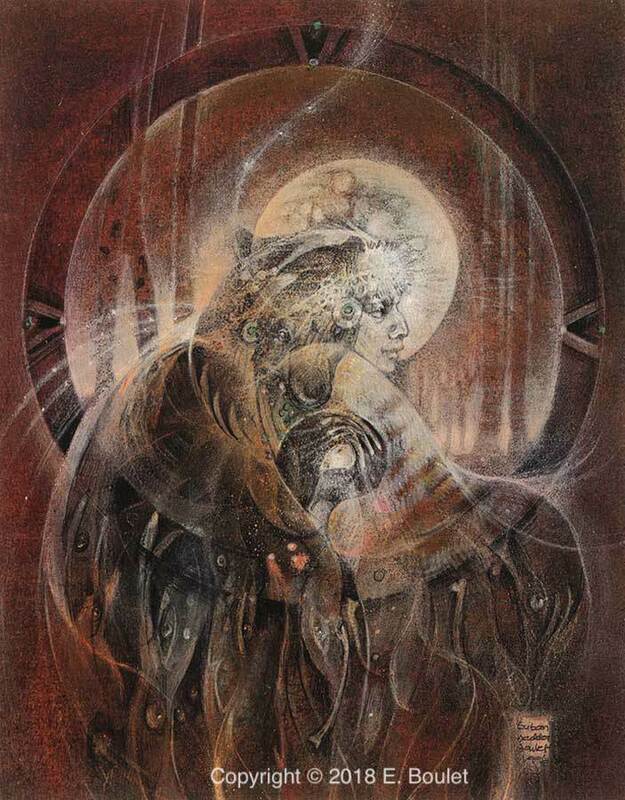 In this painting we see how Psyche was able to integrate her inner darkness with life itself, represented by Eros and also by the spiral across the front of the piece, inspired by a program on DNA, the blueprint for all life. In terms of the cancer, at this time Susan was apparently in remission and thought she had put the cancer completely behind her. There must have been an exhilaration, a feeling that life could now be lived again fully. I think more than any other work of Susan’s, this piece has a passion and an ecstasy that I feel resulted from having to confront her own death and coming out on the other side. Cancer does that: even as it forces you to look at the greatest darkness it can also lead to a sense of joy, transcendence and the integration of all sides of yourself. One of the central emotions brought up by any illness, and even more so in a life-threatening illness such as cancer, is vulnerability. We generally don’t do very well with vulnerability, a feeling of being exposed, raw and fearful. Susan was no different. One of the things she had to learn was how to nurture herself. 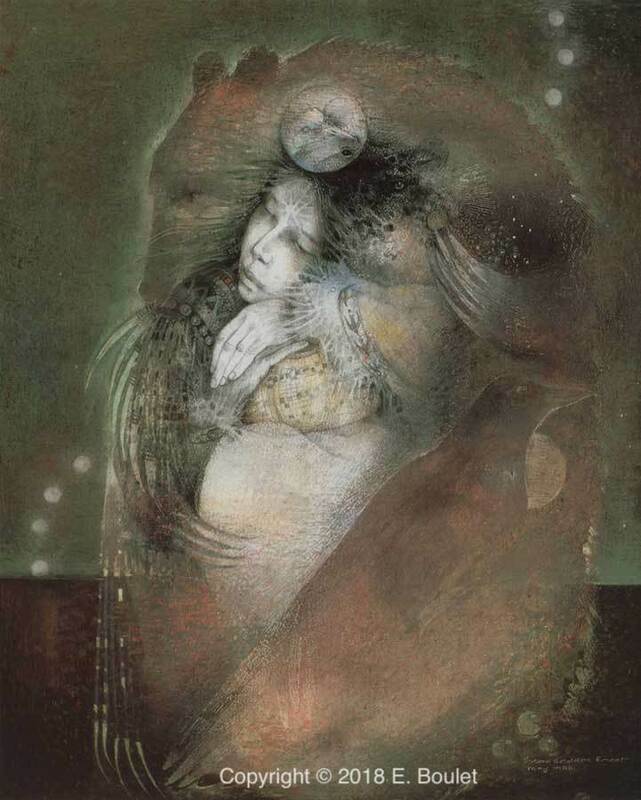 Evening Star, painted in 1992, is one example of Susan’s representations of nurturing. It is another version of the myth of Psyche and Eros, this time from the point of view of Aphrodite, the goddess of love and the mother of Eros. 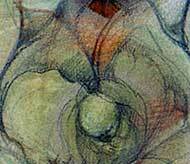 It is richly colored, with characteristic flowing lines throughout. In the myth, Aphrodite gave Psyche the tasks that ultimately led her back to Eros. In the usual telling of the myth, Aphrodite is portrayed as jealous and mean-spirited, the tasks meant to be too difficult to complete. Susan’s version is a departure: it shows Aphrodite as a dove, one of her many forms, and embracing Psyche and Eros. In fact, I think that the cancer was, for me, a way of grounding myself into my own life in a way that I’d never been grounded before, I mean it really did pull me into me, into my own life, I mean I really had to come back because I’ve had to take care of myself, I had to pay attention. Before that I had always expected that there would be someone who would take care of me and so it was an act of becoming responsible, of maturation and by doing that I had to go into my own, into my own darkness, as it were. The bear was one of the most important figures in Susan’s inner world. To understand this, we go back to an earlier piece, Dream Basket from 1986, which depicts the central event of a guided shamanic journey that Susan underwent the year it was painted. In the journey she was visited by a bear, who she connected with her mother. She described the painting as a breakthrough in her own inner work. Susan’s mother had died when she was barely two years old. Susan had virtually no memories of her mother, just the experience of great grief and a sense of overwhelming loss. Although Susan said that she had a happy childhood, she also talked of how she endured periods of intense loneliness, of crying and telling her doll her deepest sorrows. 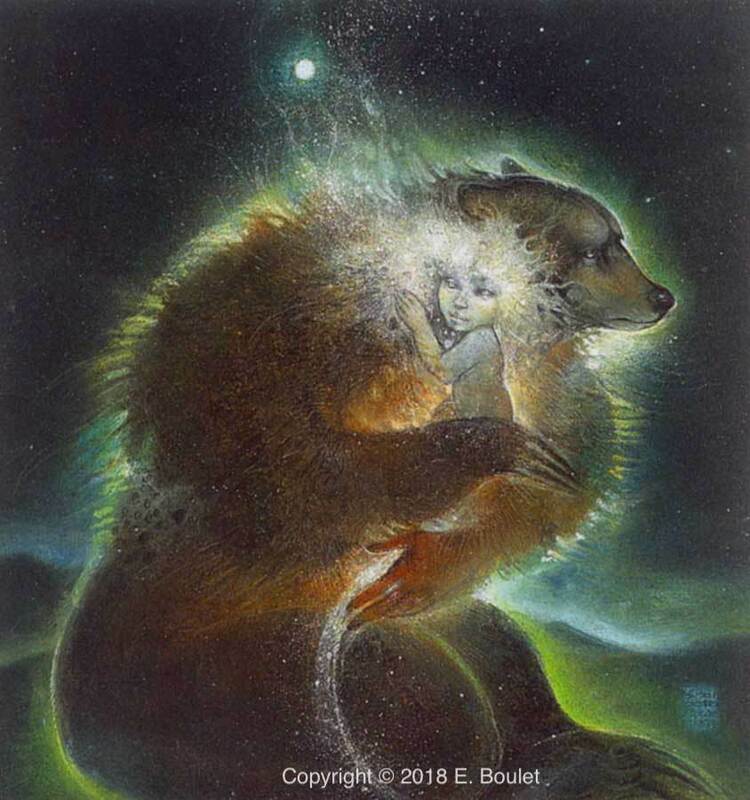 What stands out here is the tenderness of the embrace of the bear: the bear is enfolding the woman who in her perfect safety can dream on, can gather her dreams in her basket. The basket is a container, a symbol for the eternal feminine. Dream work was the first tool that Boulet used for self-understanding, a tool she returned to throughout her life. Susan used the bear-mother, a nurturing companion full of tenderness and healing, as a way to nurture herself. 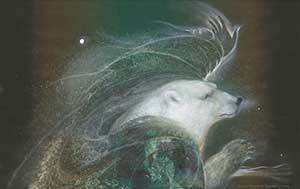 In her art the bear is a strong emotional support and healing vision, an integral part of learning to love herself. Dance of Relationship has a joyous movement, it shows a woman embraced by a bear as they dance. It’s hard to see where one figure ends and the other begins. (Click on image to see a larger version.) 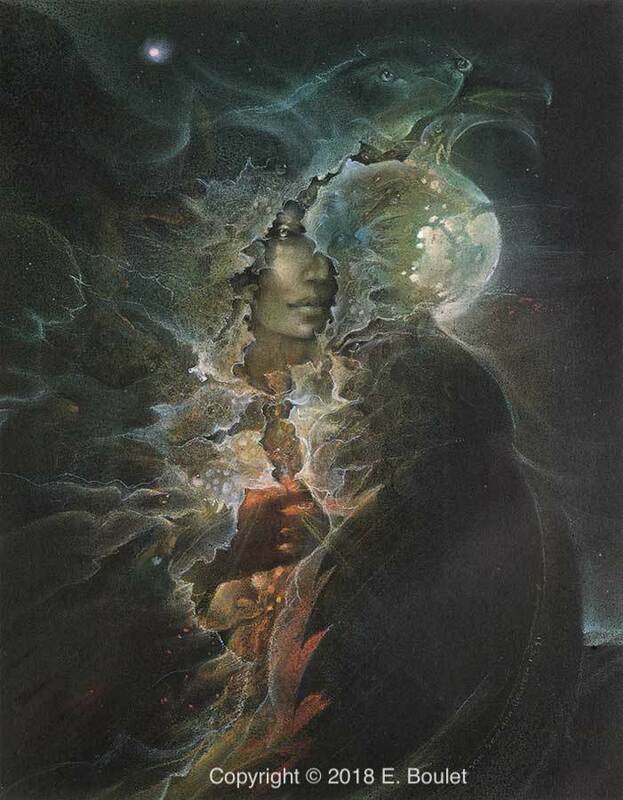 The woman is holding what looks like a sprouting seed, new life coming to birth and at the same time putting down roots. 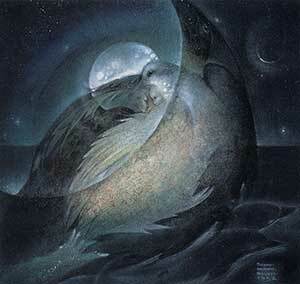 The feathers in the lower center part of the piece echo the embrace of the dove in Evening Star. This, too, is a piece of integration as the woman’s face merges into another (male) face, as if they are kissing. It’s almost as if the bear is dancing the two figures together. 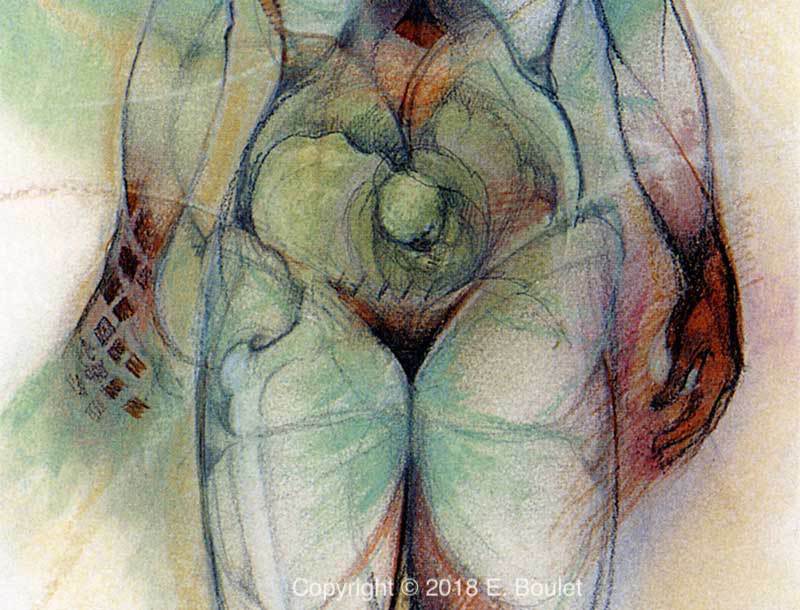 Painted in late 1991, in the midst of her cancer when Susan was still in the process of dealing with her breast reconstruction, Susan still found a way to celebrate and to nurture herself through imagery. Just as with life, experiencing an illness is never just one thing, never just pain and sorrow. Just as with life, it brings up the whole gamut of human emotions, even the joy of dancing, if you can open yourself. We see this lovely nurturing again in a piece from mid-1995 that Susan named Bear Woman and the Dream Child. 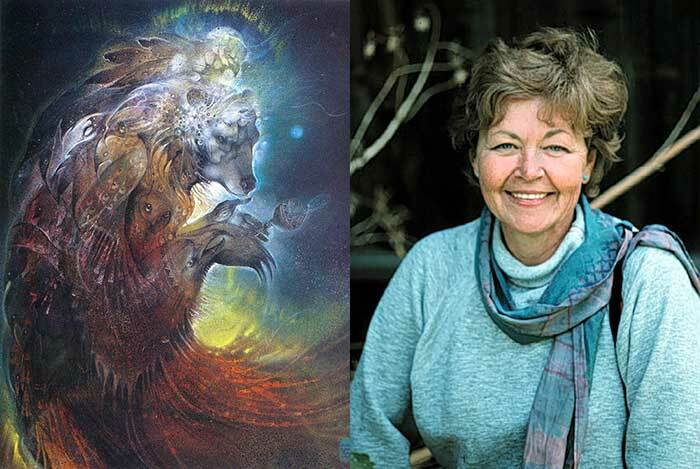 Dreams were Susan’s first entry into self-work back in the early 1970s and remained an important part of her ongoing self-discovery for all of her remaining life. At the time this was painted the cancer had returned with a vengeance and Susan was just recovering from the removal of portions of her lungs to which the cancer had spread. Surely at this time Susan felt particularly vulnerable and in need of comfort. There’s a poignancy to the piece that mirrors her own fragility and need to be held at that time. With this piece, Susan again was able to find nurturing from her bear ally. 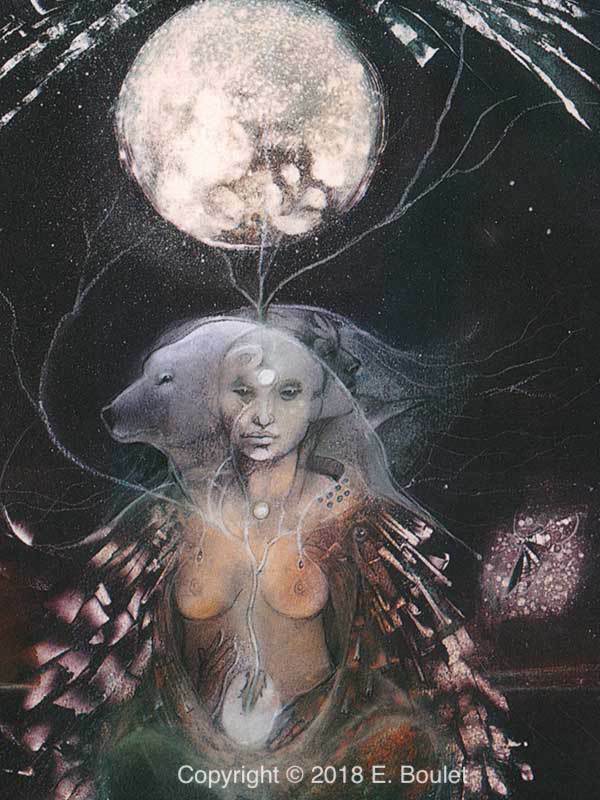 Notice that the bear's left hand is a human hand, (click on image to see a larger version) representing a shamanic merging of human and animal found often in Susan's work. 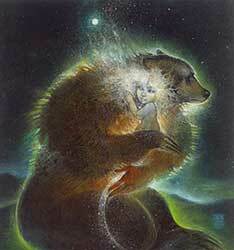 Here again the bear's embrace provided great tenderness and safety. After nearly 1-1/2 years of reasonably good health, in spring 1994, Susan developed a bad cough. In July 1994 she was shocked when a biopsy revealed cancer in her lungs. In December 1994 she had portions of her right lung and lower left lung removed in a long, grueling operation; the recovery wav difficult. She refused conventional treatment and then in August 1995 she was having difficulty breathing and difficulty with any sort of exertion. 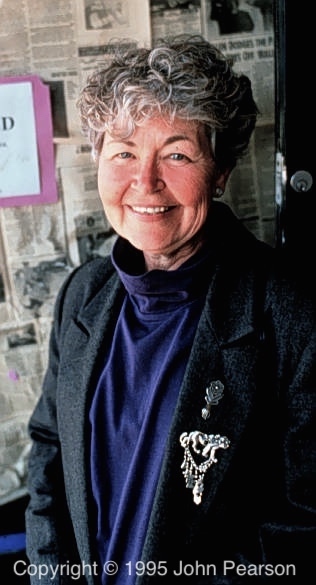 In September 1995 she began a debilitating round of chemotherapy, which lasted until February 1996 and during which she felt listless and had no energy. In April 1996 she found out that the cancer had spread to her brain and in May she started a 3-week course of radiation therapy. Her condition continued to worsen with extreme shortness of breath until she had to have an emergency tracheotomy in August 1996. In December 1996 she suffered a grand mal seizure and continued to worsen. For the final weeks off her life she required around-the-clock care, up until her death on April 28, 1997. Of course . . . there are pieces that deal with the pain and suffering from the cancer, particularly after the shock of its recurrence. 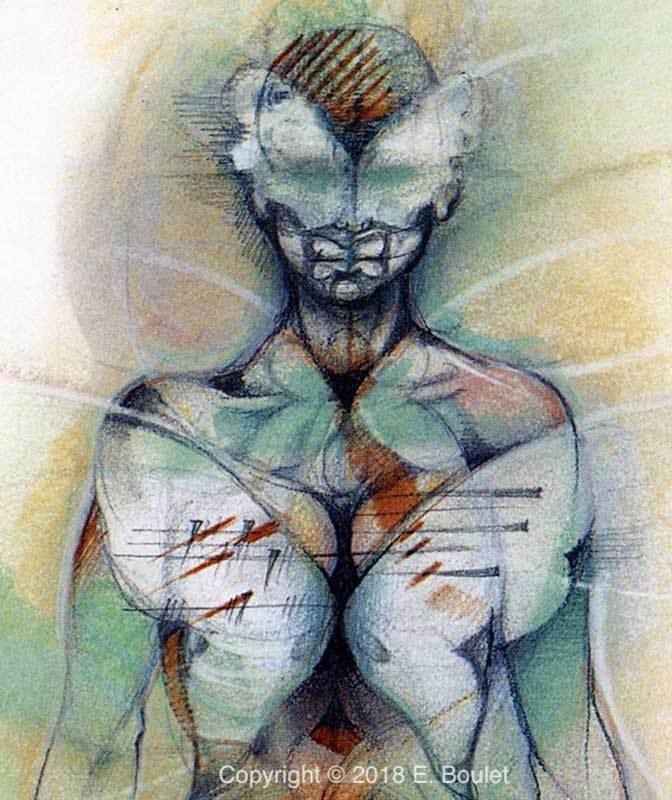 This is most visible in the piece Reconstruction, painted in 1995 soon after the operation on her lungs and when Susan was forced to make the difficult choice to return to chemotherapy, as the cancer continued to take hold in her body. in the midst of this debilitating illness, Susan continued to work. 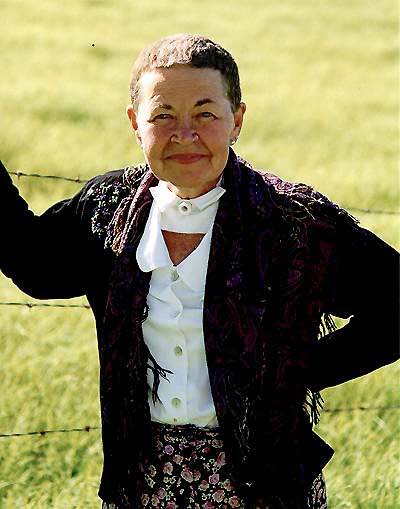 Her work was her way of self-understanding, really her way of sustaining her worlds, both inner and outer. Even so, I find myself inspired by her refusal to give into the cancer, her determination to continue to live her life fully. And yet in what is perhaps the darkest and most difficult piece that Susan ever painted, there are symbols of hope and of re-birth. 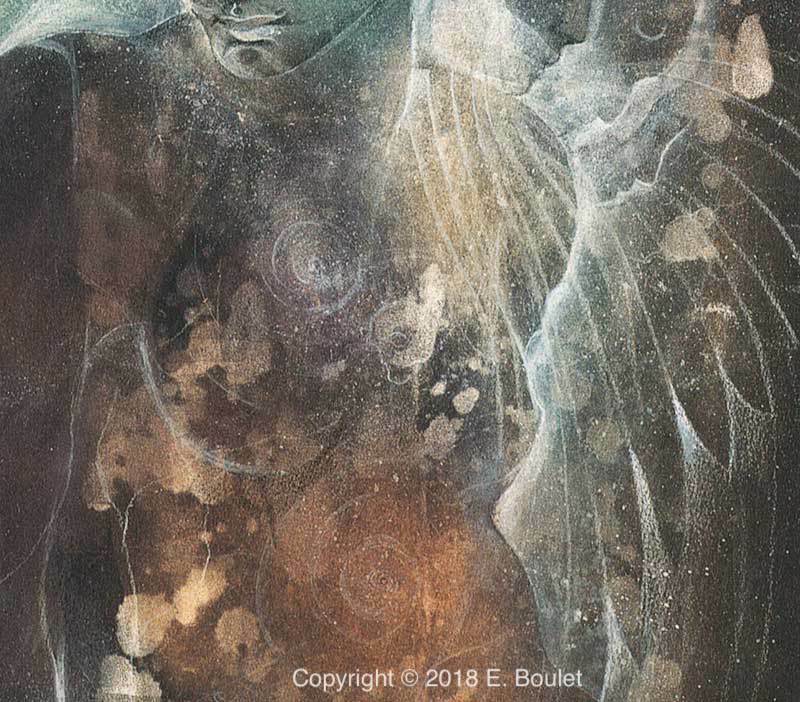 Several butterflies cover the body; the butterfly ties this piece to the myth of her beloved Psyche and Eros, for Psyche in Greek also means butterfly and Psyche often is portrayed as a butterfly or with wings. The butterfly is a symbol of transformation, the ability to change, the possibility of adding wings to one’s life, to find the ability to fly and to soar. The butterfly is also the form that the soul takes after death in many cultures, so here it also serves as an acknowledgment of her own coming death. In the center of the womb is the head of an infant: new life has gestated and is waiting to come into the world, to be born in the midst of this horror and suffering. Giving birth is not always easy: the labor of birthing can be intense, painful and difficult. Above the infant is what appears to be a blossom: again, life and beauty is here, just waiting for the correct time, the correct season, to break forth in beauty. 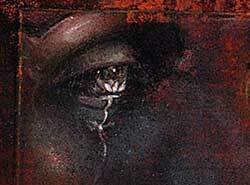 I think back to the flower in the eye of the grieving Persephone. Somehow, even in her darkest times, Susan remained connected to hope, to growth, to transformation and to beauty. It is a stunning piece; a humbling piece. Yet the piece is nonetheless filled with signs of rebirth and generation. 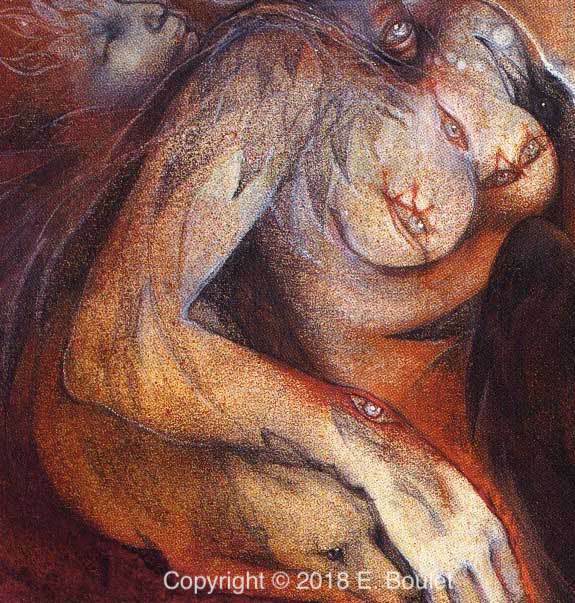 There’s the sprouting seed that the figure holds in her hand, its tendrils creeping up the arm; there’s her pregnant appearance and the spirals on the womb and chest. Following the work of Susan's teacher, Angeles Arrien, the spiral signifies growth and evolution; it also recalls the spiral as DNA, as the source of life itself (as seen in Transcendence.) Three profiles emerge from the figure’s skull, which appears to be bald – baldness often results from chemotherapy. 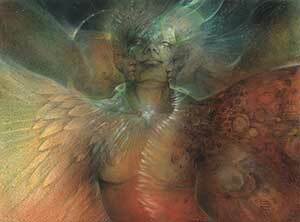 The three profiles are surrounded with wings, as if portraying a soul ready to take flight. 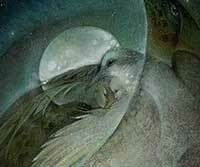 Susan would have known that in the shamanic tradition, feathered robes represent the journey to other realms. 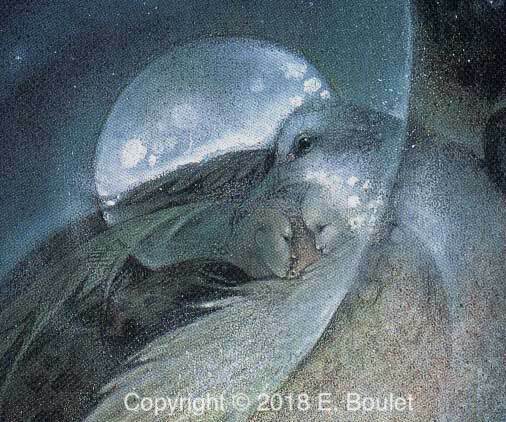 There are two bird heads in the piece (towards the top, on her head and to our left of the head), indicative, again, of the soul taking flight. This is a complex piece that surely represents the changes and trials that Susan was experiencing at the time. Dark Angels, from fall of 1996, is one of Susan’s last pieces. She painted it soon after her emergency tracheotomy. 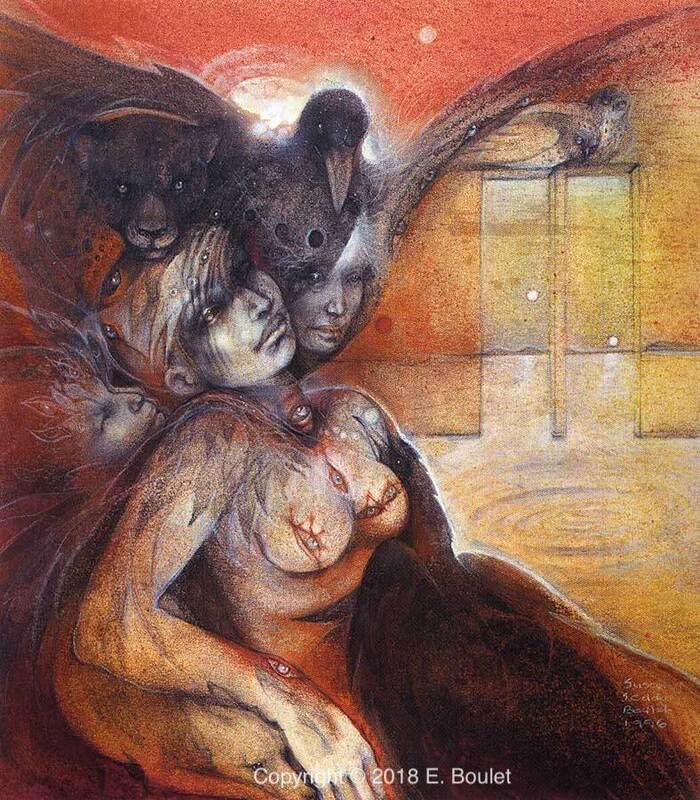 The central figure, a woman with lacerations on her breasts, is surrounded by dark, foreboding faces and animals. The impact of this disturbing piece is heightened by the contrasting colors. 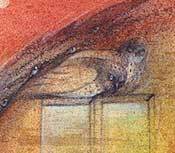 Owls sit on two open doors to the right. These owls bring to mind another piece Susan painted in 1985 titled Keeper of the Gate. 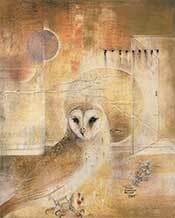 That piece was the portrayal of a dream in which her dead husband, Larry, came to Susan as an owl, a traditional symbol of death worldwide. Concretizing the dream comforted and helped Susan, finally, to accept and come to terms with her husband’s death 5 years earlier. Perhaps the owls in Dark Angels allowed Susan to come to term with her own death. In Dark Angels she included a raven, associated with death in many cultures and often considered to be a messenger and a guide. The dog to the lower left recalls that Susan had owned dogs all of her life: they were always her fiercely loyal friends. Yet the dog in many cultures is a psychopomp, a conductor of souls to the underworld. Here again we see a spiral, a symbol of growth and of evolution, directly in front of the two doors, which perhaps symbolize the barrier between life and death. Again, in the midst of the pain and suffering of her body brought about by the cancer, Susan is looking forward to her transition, to rebirth and to moving on. Ultimately, I believe Susan came to terms with the illness. She passed through so many emotions and stages yet, ultimately, what was there to do but to find acceptance? 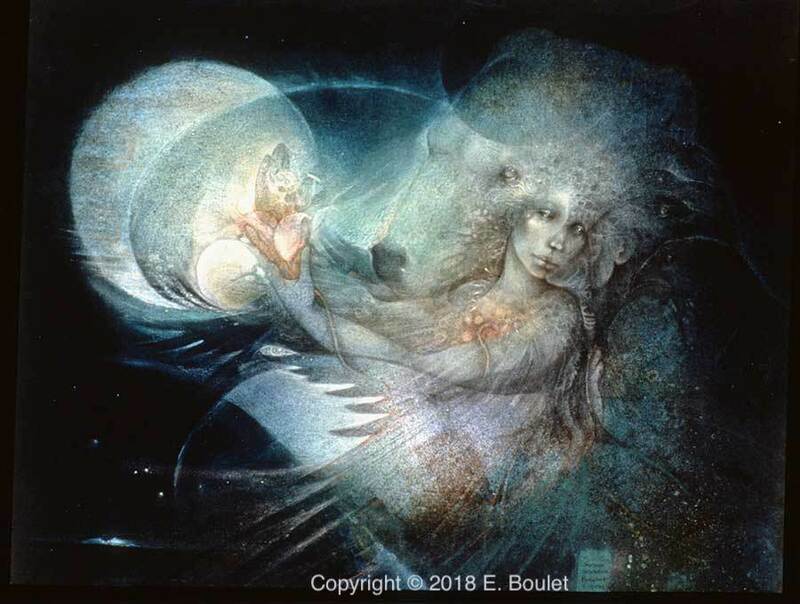 In Kindred Spirits, painted in early 1996 at a time of great fatigue, we again see Susan’s beloved bear: it is impossible to tell where the bear ends and the human begins. 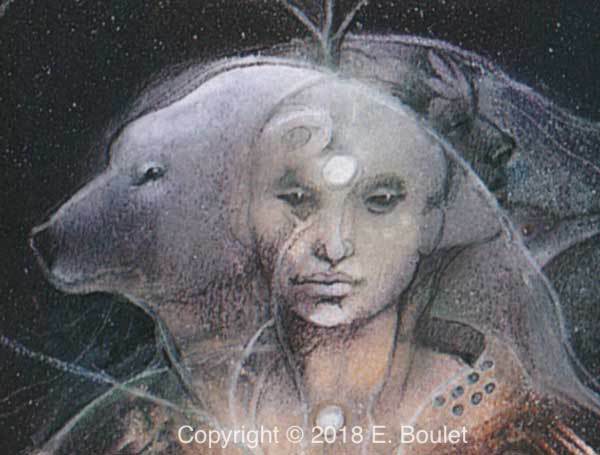 The two merged figures are partly in a circle through which we see the moon and some trees; the circle is in the form of the Native American Sacred Hoop, representing the sacred outer boundary of the Earth. Here it is almost certainly a representation of the barrier between two worlds, that of the living and that of the dead. The work has the feeling of a pause, as if the figure, supported and embraced by the bear, is convalescing and contemplating what is yet to come. 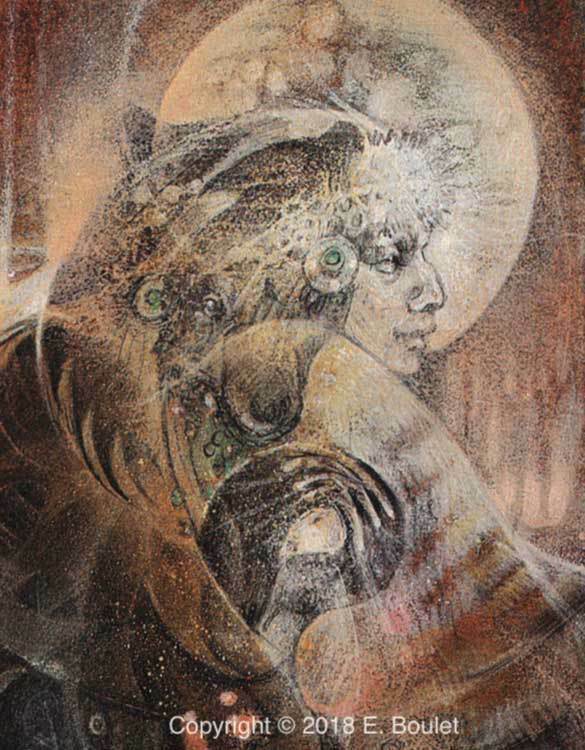 There are hands in the middle of the piece holding onto a sphere, perhaps a crystal ball, as if the figure is trying to see into the future. What is yet to come? All of the light is towards the upper part of the piece, as if the double figure is moving towards the light. There is a poignancy to these intertwining figures supporting one another – the gentleness and human gaze of the bear and the older, tired looking human figure in the background. As the moon and trees come through the framing circle, it is as if the couple are partly in one world and partly in the other, already setting off together into a new world, another moonlit place. Whatever is to come, it will be met with equanimity from the protection and calm provided by a kindred spirit. There is a somewhat similar feel to the piece Shrine, painted a few months after Kindred Spirits when the cancer had spread to her brain and she was again dealing with chemotherapy. A mixture of monotype and oil pastel, it illustrates what a person might see going into a shrine. A full-figured woman, triple-headed with one head that of a bear, sits under two moons. As appropriate in a shrine, I believe this is a representation of the Triple-Headed Goddess, a subject that Susan painted many times. The Triple-Headed Goddess represents the Goddess as Virgin, Mother and Crone, three of the principle roles of a woman in her life. Susan would have naturally been looking at the totality of her life as the end came closer. I see the darkness of the piece as echoing Susan’s approaching death. There appears to be a great acceptance at this point: the faces are calm and the central figure is in a posture of meditation. The central figure holds a seed, sprouting life and flowing up into the dark sky: it brings to mind the seed in Dance of Relationship. The moth to the figure’s left is a symbol of rebirth and reminiscent of the moth wings given to Psyche in other earlier pieces. The strong association for Susan of the bear and mother call to mind that the Goddess in her totality rules over both life and death. I imagine this was a comfort to Susan: that perhaps the loving embrace of the bear/mother might await her. Painted at the same time as Dark Angels, Shrine shows another side to her story and her struggles: acceptance and calm about her situation. It tells of comfort, growth, renewal of life and ongoing transformation. I feel as if the piece Playing with the North Wind, from the same show as Shrine and Dark Angels – Susan's last show in November 1996 – is another piece of preparation for her death. 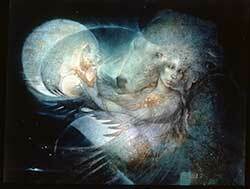 Here we see a bear with one animal paw and one human hand, a complete merging of human with bear essence, waving and playing with the north wind. Wind is universally a symbol for the spirit and for spiritual energies. In the teachings of Angeles Arrien, with whom Susan studied for many years, north is the direction of winter, the warrior, darkness and death. Susan’s title for the piece tells us that here, at the end, she and her bear protector are finding a way to play with the wind of the north, with death and darkness. She is telling us that she is becoming friends with that aspect of the universe. Whenever I see this piece, I feel as if it is Susan’s way of waving goodbye to us all. The pain and suffering of her earlier pieces is wholly absent here: there is just a calmness and playfulness. So many of Susan's final pieces include bears! It was such a symbol of mother-love and nurturing for her. As they reflect her forthcoming death, I feel that they indicate that Susan had come to accept what was to come, that she perhaps saw death as a merging with the mother, and a merging with a nurturing, healing mother. I would like to think that this gave her comfort and allowed her to pass from this world quietly and at peace. Although the image of Playing with the North Wind would be a natural place to stop, I want to end with another image. This one is a composite. 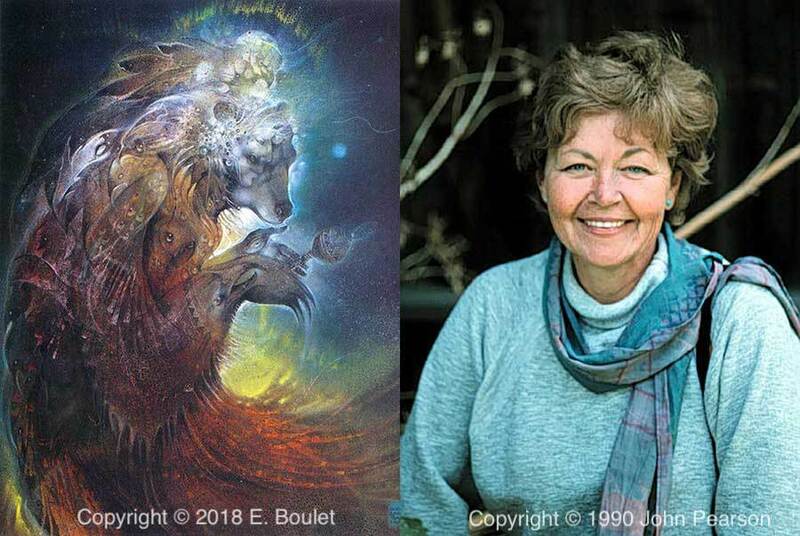 On the one side is another of Susan’s beloved bears – Bear Woman Dancing – from 1995 – again merging with a human figure, and on the right is a photo of Susan from 1990. I end with a picture of Susan and one of the many pictures of the inner world that she revealed to us. I want to remember Susan smiling and, inasmuch as her paintings reflect her innermost being, I like to remember Susan dancing. Susan, through her art, revealed the depths of the inner world to us. She shared her courage and her journey to a healing beyond physical healing. She was only 56 when she died and yet left behind such extraordinary glimpses both of her own process and of the wider unconscious that we all share. She made the mythic realm visible. Her images remind us that illness and adversity do not need to define or to defeat us, that we can use them to grow, to heal and to transform. 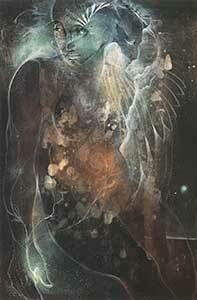 Susan Seddon Boulet: The Goddess Paintings. Published by Pomegranate.